Just as Ray Bradbury's novel Fahrenheit 451 identified a temperature at which paper self-combusts, the Australian Open has just shown the world that there is a temperature at which tennis players start to hallucinate about Snoopy. So how hot is too hot? Unbeknownst to many until this week - when heat-stressed players have fainted, vomited and even seen Snoopy on court, in what some have claimed are "dangerous"conditions in Melbourne - there is an established process for when to stop play at many international sporting events. The method was developed initially by the US military in the 1950s to identify levels of heat stress, to restrict activity and monitor required rest intervals and water needs for soldiers. Known as "the Wet Bulb Globe Temperature", it takes into account temperature, humidity, wind speed, and exposure to sunlight. When you combine all that information, you get a better indicator of how comfortable the weather really is. The Wet Bulb Globe Temperature formula produces an adjusted temperature, one that is never as high as the number you get simply from measuring outside air temperature. But even though that Wet Bulb Globe Temperature might look like a lower temperature, even a few degrees of heat can make all the difference to how our bodies function. Put simply, if your core body temperature gets too hot, your organs will start to fail - and that kind of heat stress can be deadly. In order for our bodies to work properly, we eat. Those calories give our body the energy it needs for our muscles, organs and nervous system to work properly. The biochemical reactions that turn the calories from the food into energy, produce heat. When outside conditions are temperate, this heat keeps us at a comfortable core body temperature of around 37°C degrees. As the external temperature increases, that heat needs to be lost from our bodies, which is done via dissipating it through our skin. That's why when you are hot, you sweat, take off layers of clothes, stand near a fan, go into the shade, you do less exercise, and drink water - all very good ways to quickly get the heat out of your core, through your skin. But when this temperature gradient is reduced, for example due to an increase in temperature and humidity, your body has a harder and harder time getting rid of this heat fast enough. And it's a poorly recognised fact that, just like paper, our vital organs have an equivalent self-combustion point - that is, a temperature that they stop working. Once your core body temperature reaches 40°C, your organs begin to fail, and unless you get into cooler conditions immediately, you will die. So how hot does it have to be to make your core body temperature rise to lethal levels? Depending on a range of conditions, as measured by the Wet Bulb Globe Temperature, it's commonly thought that your skin needs to be below 35°C in order for your body to effectively dissipate the heat that it is producing. This means that the Wet Bulb Globe Temperature must be well below 35°C: which fortunately, for the vast majority of the inhabited places on the Earth, it is. Complicating this daytime heat extreme is a longer term factor. If the higher temperature conditions do not relent at night, resulting in a run of hot days and hot nights - also known as a heatwave - people will die. That's what has happened during heatwaves in many parts of the world over the last decade, including in Europe, Russia and the US. In many of these places, deaths have occurred where the temperatures are considered only "moderate". That's because people living in these regions have not been able to acclimatise to extremes in temperature, either physiologically or by taking precautions such as by resting inside during the heat of the day. 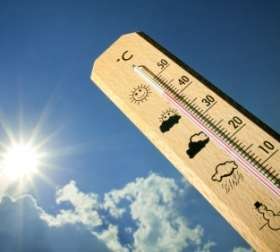 Vulnerable people, such as children and the elderly, are especially susceptible to heatwaves because their bodies need to recover in cooler conditions at night in order to prepare for the following day's heat. So if night time temperatures do not go down sufficiently, the health problems amplify very quickly. Why would a climate scientist be thinking about what is ostensibly a health problem? As the Intergovernmental Panel on Climate Change's forthcoming climate impacts and adaptation report is likely to suggest, Australia and much of the rest of the world, is projected to experience an increase in extreme weather. That is expected to include rising average temperatures in many parts of the world, and more frequent heatwaves across Australia. What does that mean for us today? In less time than it takes for a toddler today to reach retirement age, the business-as-usual climate change projections indicate that many areas of the world will begin to experience conditions inhospitable to humans. These projections indicate we must not only reduce global greenhouse gas emissions, but also be prepared to live in a more extreme world. Muslims are trying to kill you every day, but you're worried about what "might" happen 80 to 100 years from now. Nice, racism. What next Returners, all them black people breeding in Africa? And yes, frankly, I am very concerned about what conditions are going to be like for my grandchildren and great grandchildren. That you would say that speaks much about your selfishness. I hope you don't have children.